A great blue heron on a piling at dusk in Hilton Head, SC. Well, the weather finally turned around, and although we enjoyed our stay, we really did make it out of the Beaufort area and even South Carolina. Leaving the dock at Skull Creek marina proved to be a nail biter, as the wind and tide were in the wrong direction to safely motor away from the dock (the dock was perpendicular to the current and wind, and we had about two and a half boat widths of clearance to the next dock). 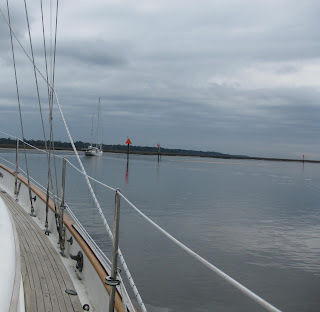 We reluctantly decided to take the advice of the dock master who told us to let go of all the lines but the bowline (WOT???? 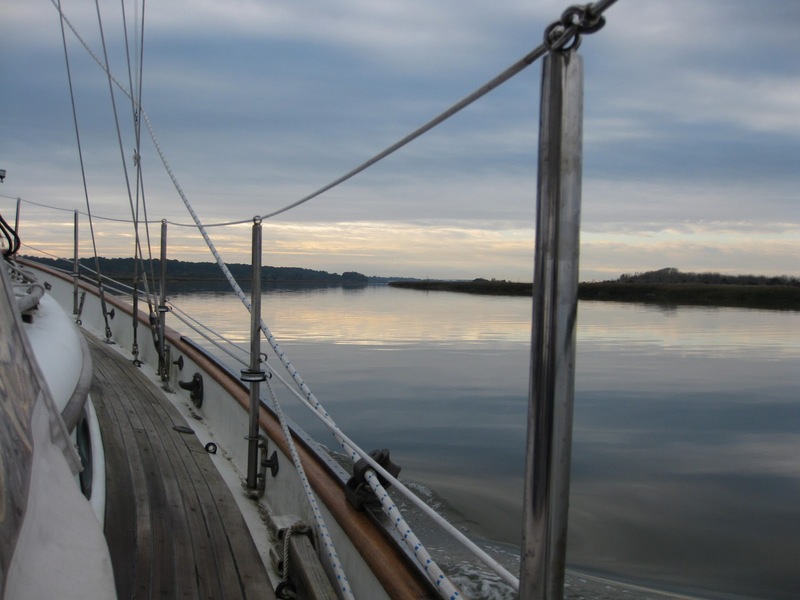 ), using the bowline to position the bowsprit between the two cement pilings and snugging her bow up to the dock as Layla turned perpendicular to the dock. Layla’s stern did exactly as the dock master predicted and Fred was able to motor Layla bow first away from the dock. We really wanted to stay as far away as possible from our old stomping grounds, but it was inevitable. We left Hilton Head, South Carolina, and before the day was through, had crossed over the border to Georgia. We spent the next couple days cruising through some of the most beautiful marshes along the Georgia coast. 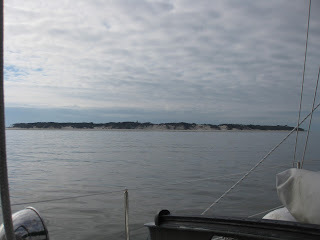 One day, as we motored through Saint Catherine Sound area, we must have seen at least fifty dolphins just cruising through the estuary. Marshes adjacent to the Isle of Hope, GA in the morning. 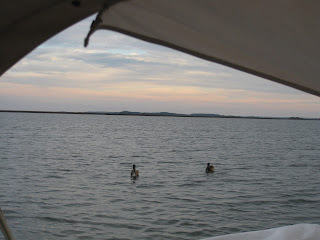 North end of Cumberland Island, GA.
Pelican visitors for breakfast at our anchorage near Brunswick, GA. Entrance to Jekyll Creek, GA.
We had heard horror stories of navigating through the Georgia section of the Intracoastal Waterway, as the ICW is not well maintained due to funding issues, but managed to come out unscathed for some strange reason. The following are some of the ‘fun’ challenges we faced along the Georgia ICW. 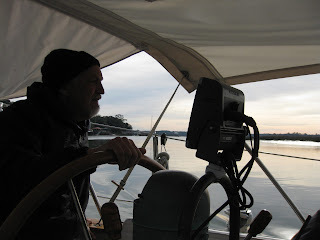 Bud at the wheel, tensely navigating through the Georgia ICW. One of the first obstacles we encountered was an area called ‘Hells Gate’. According to me, the name says it all, but if you are curious, it is an area notorious for continual shoaling. There are several nun buoys marking the latest survey, and as long as you follow these carefully, along with your depth sounder, and pass through on a rising tide, the channel is a piece of cake! 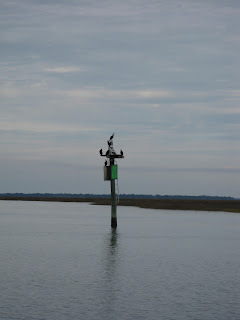 Several areas of the Georgia ICW are ‘humpy’, and can change in depth by more than two feet with no warning, even smack dab in the middle of the channel. With the channel depth averaging 9.5 feet and Layla’s draft of 6.5 feet, let’s just say we had multiple opportunities to clean the bottom of our keel. We did officially go aground along Jekyll Island. 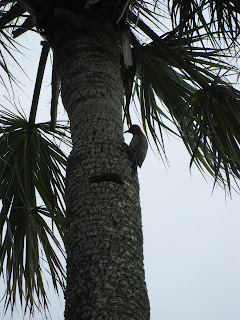 On the north end of Jekyll Island, Bud and I noticed about a hundred little birds on the west side of the channel. At first the birds looked like they were floating on the water. However, as we got closer and closer, it was clear that they were actually standing on a mud bank, about a third of the way into the channel. Just about the time we came to this realization, it was too late, and we were stuck in the mud. One of the strangest part of the Georgia ICW is entering into Kings Bay and the Naval base. The north entrance into Kings Bay is another well-known area for shoaling, and is littered with repositioned markers. 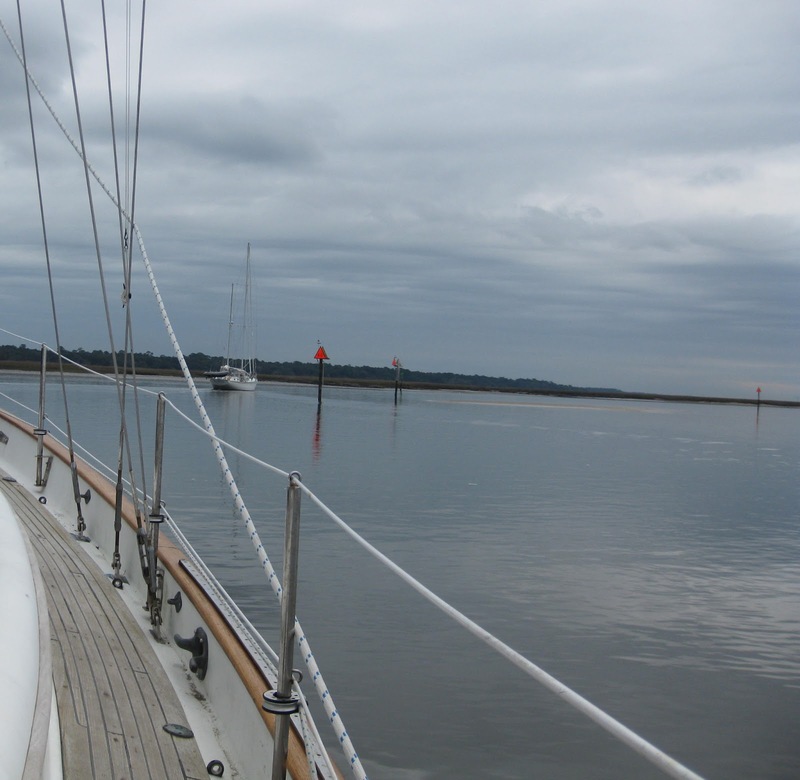 Unlike many boats with shallower drafts than Layla, we managed to snake through the area without going aground. Perhaps the Going Aground Gods had already been appeased, as we had heard from the previous owner that Layla went aground here about three years ago. 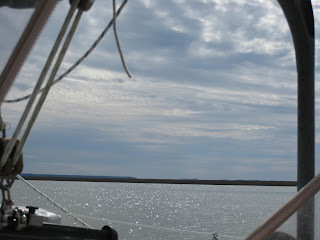 Snaking through the ICW just north of Kings Bay. The guidebooks describe Kings Bay as being difficult to navigate, as many of the markers are missing or have been renamed. Whether this is intentional or not, the Navy does not like cruisers to take their time or detour through the area. We have heard stories of cruisers being ‘escorted’ through the bay by Navy boats to ensure their speedy transit. 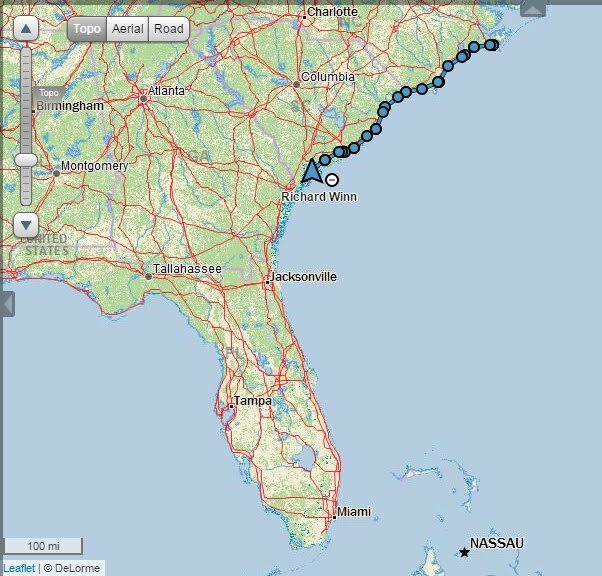 About a month ago, we finally crossed the border into Florida, and were warmly greeted by Fernandina Beach. Fernandina Beach is an interesting town, with a quaint downtown area sandwiched between two plants operating 24/7. 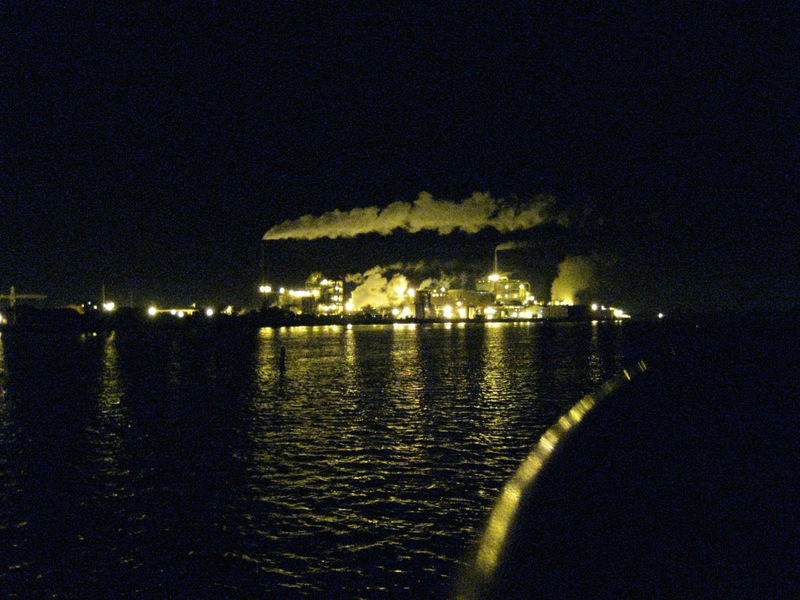 At night, with the lights illuminating these two steaming smoking beasts, Fernandina Beach has the look and feel of Gotham City. However, during the day, if you put on your blinders and focus on the marina and downtown area from the mooring, you see tons of bird life, a couple of nice bookstores, a good ice cream/coffee shop, some excellent restaurants, an OK library, a funky hardware store, and colorful Victorian style houses. 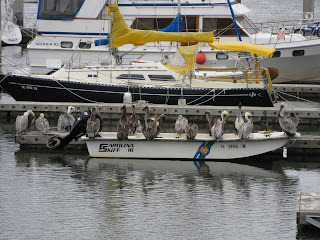 Thanks to a seafood market adjacent to the marina, I was able to see pelicans closer than ever before. The pelicans didn’t seem to have aversion to humans; they would fly so close that you could almost reach out and touch them. 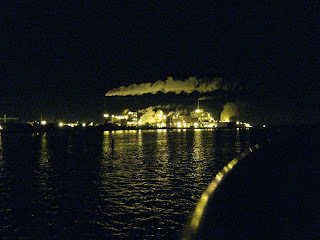 View from our mooring in Fernandina Beach, FL at night. 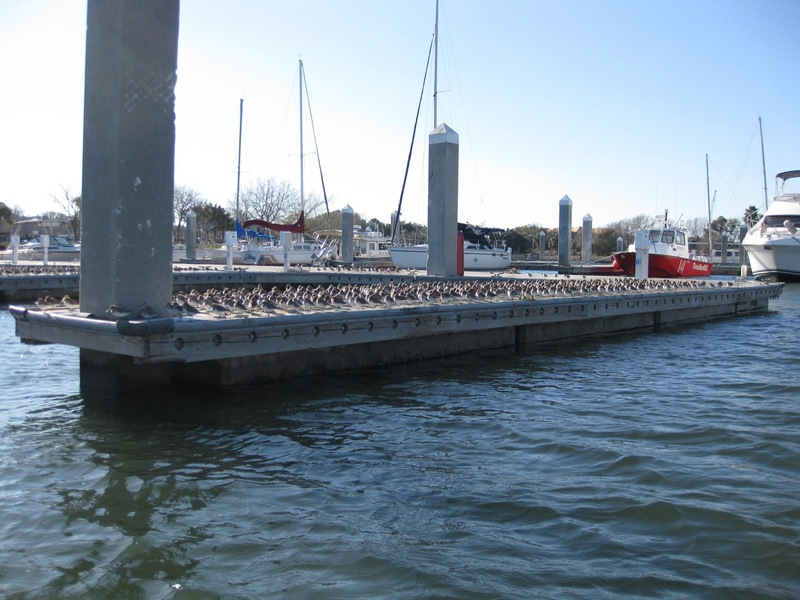 View of the Fernandina Beach mooring field from the marina. Much better. Birds at the marina dock in Fernandina Beach, FL. 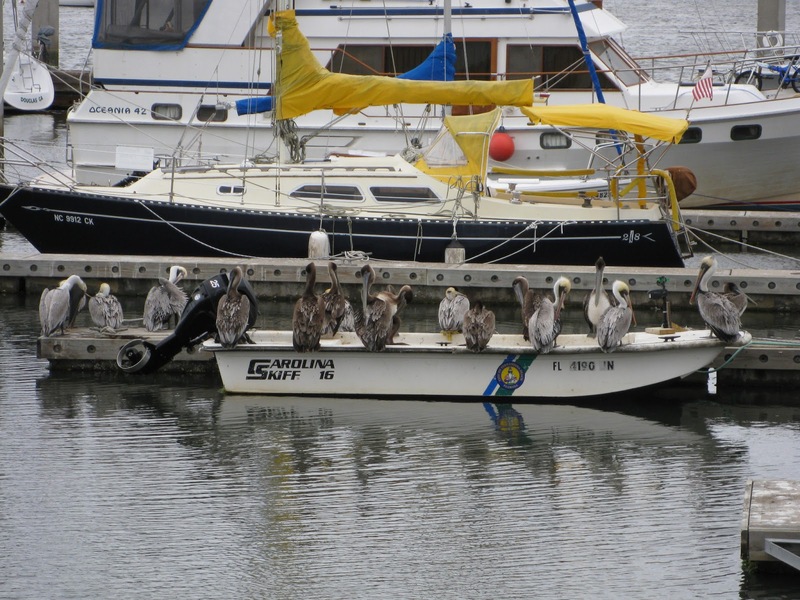 Pelicans waiting for the fish handout from the seafood market. After a couple days in Fernandina Beach, we headed to St. Augustine, one of the oldest towns in the US. Although the architecture is beautiful and the food is pretty good, St. Augustine appears to be turning into a tourist trap. 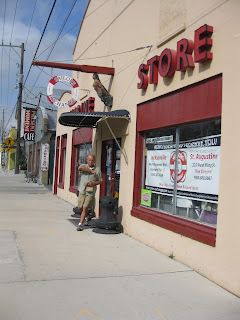 The highlight of our stay in St. Augustine was discovering the Sailors Exchange, a used marine supply store. 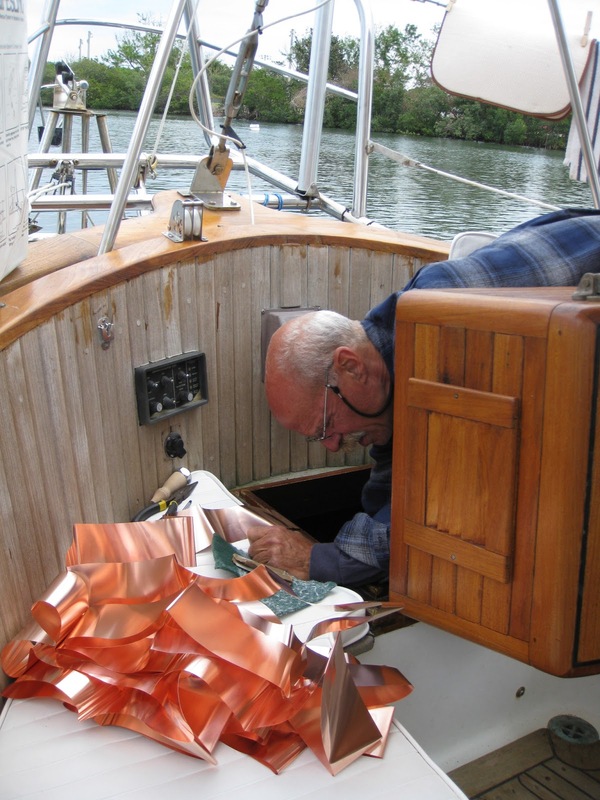 From sailing books to marine hardware to rigging to folding bicycles, they had at least one of every kind of part found on a boat. I went back a couple times finding things I haven’t been able to find elsewhere, like bronze latches and marine switches. And Bud picked up a snap shackle for a song. 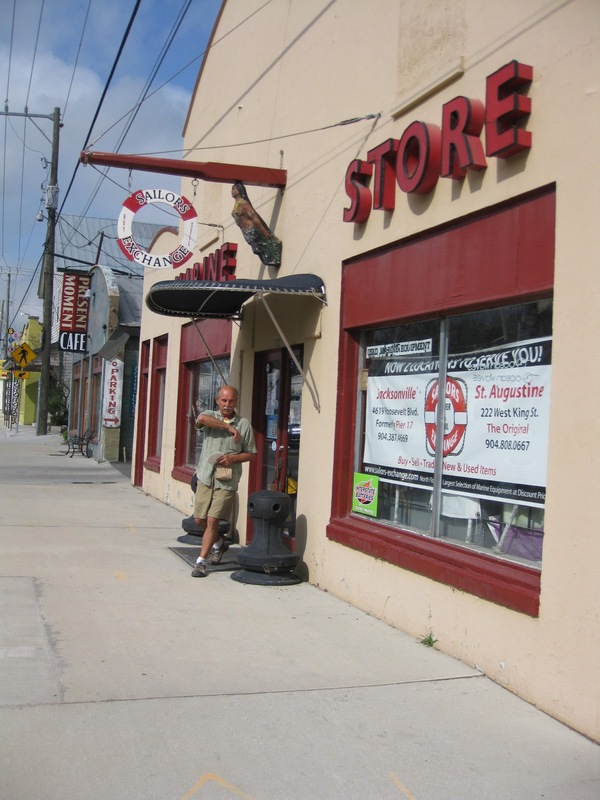 We have heard that there is another marine supply store down in Fort Lauderdale called Sailorman. Forget the beaches, it is Sailorman or bust! Sailors Exchange in St. Augustine, FL. After a couple days in St. Augustine, we headed south through the Mosquito Lagoon and the Indian River Basin to Vero Beach. Mosquito Lagoon was quite a pleasant surprise. Mosquito Lagoon is one of the largest undeveloped sound areas that we crossed, with depths less than five feet throughout (except the narrow ICW channel), butting up to an expansive mangrove forest connecting to the mainland. Birds of all kind lined up along shallow shoals: from white pelicans to brown pelicans (segregated by color, of course) to egrets to blue herons. It was invigorating. At the end of the day, we anchored in 8 feet just outside of the Titusville mooring field. We sat in the cockpit, watching the manatees swim around the boat. The shallow water and warmer temps attract the manatees to the area, and we were fortunate enough to join them. Birds resting on rocks in Mosquito Lagoon, FL. 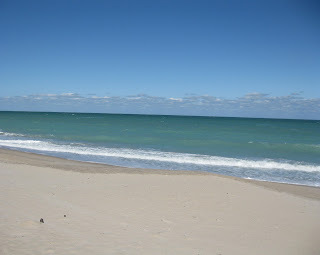 A couple of days more of cruising, we were in Vero Beach. 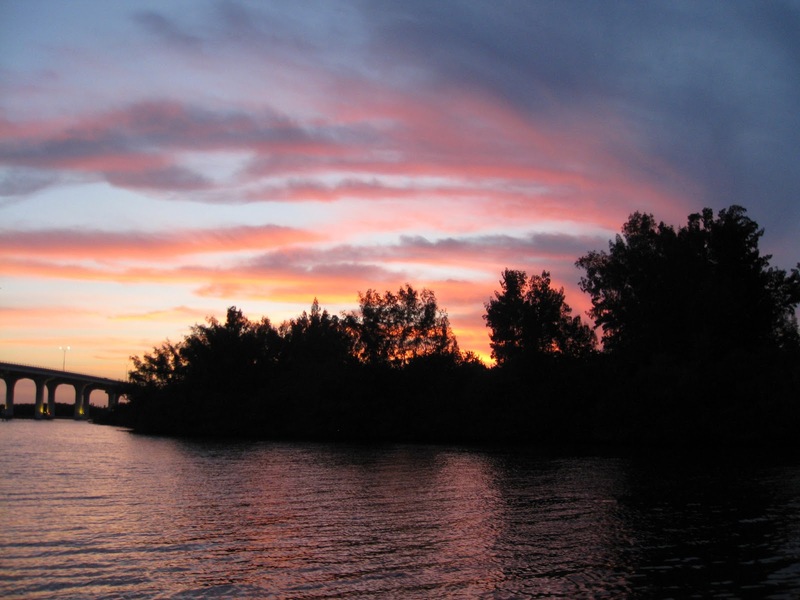 The cruising guidebook describes Vero Beach as ‘Velcro Beach’, as many cruisers end up staying here longer than planned, primarily due to the amenities. 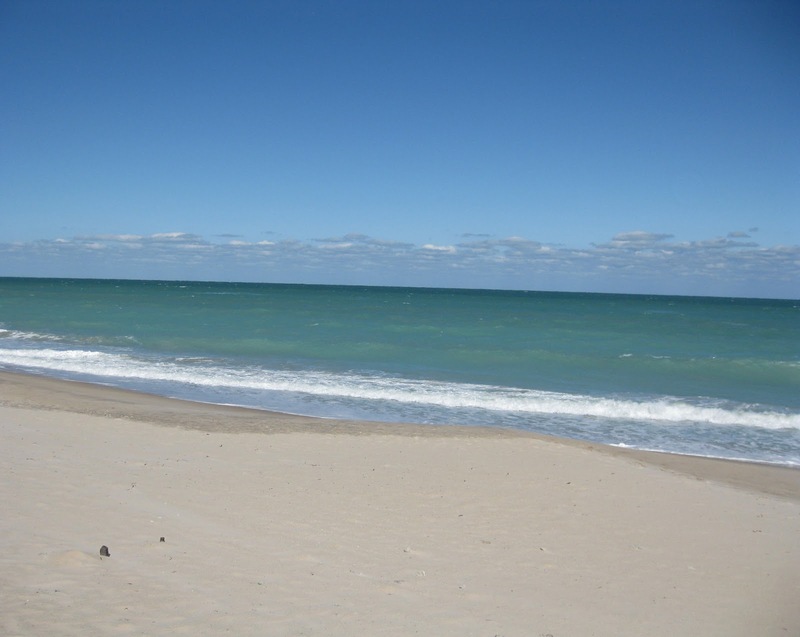 We were soon to experience Vero Beach amenities, whether we wanted to or not. I didn’t think I had an aversion to Sundays, other than growing up Catholic and going to church every Sunday. But after the past two months, I think I have changed my perspective. From the cruising perspective, Sundays are the worst day to break down, and for some reason, we keep breaking down on Sunday. And to make matters worse, it is often the Sunday preceding a major holiday. Luckily, most of the major holidays are meaningless for grease monkeys, and we only have to wait one day for help. Well, our latest cry for help happened on a Sunday morning, the day after we arrived in Vero Beach. We woke up after a very cold chilly night, and checked the engine oil level before starting the motor, as all good cruisers do. This morning’s oil check was different and highlighted the importance of the ritual; the oil level was twice the level as the previous day. How could this be? We double and triple checked, only to see the same result. Based on a quick statistical analysis, we concluded that our measurements were reproducible (or precise), and likely reflect reality (or accurate). There was some matter, most likely liquid in phase, that was infiltrating the engine oil. Based on the consistency of the oil, it was not likely to be water-based, and so the conclusion was that diesel (another hydrocarbon) may be infiltrating our engine oil. Where could this take place? The most likely point of infiltration was the fuel injection pump, which is lubricated with engine oil. After a night in the boaters lounge mixing with the local ‘moorers’ while waiting for laundry to dry, we found out that there was a marine repair guy living in the marina. We contacted him on Monday, and within an hour, he appeared at Layla and came to the same conclusion. He took our fuel injection pump off to be serviced, and we were amazed. We found out that the parts would take about a week to come in. So, we anticipated that our job would be next in line once the parts arrived. Another week went by with what appeared to be little progress. We were beginning to think that we were the next victim of ‘Velcro Beach’. Finally after two weeks of waiting, the fuel pump was serviced, and within two days, installed. 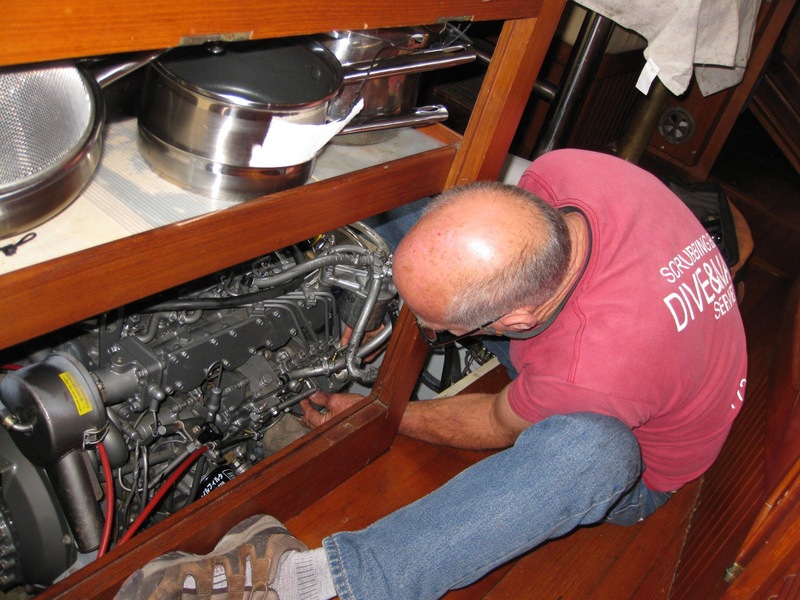 Pete removing the fuel injection pump. Some people call Vero Beach, ‘Zero Beach’. For us, Vero Beach turned out to be a golden peach. We never expected to spend over four weeks in one city along the Atlantic Coast, but in doing so, discovered the city free bus system, which gets you to all major cruisers destinations (a top notch grocery store, WalMart, West Marine, etc); the beach, which we hadn’t seen or explored this entire two month trip; a fantastic library accessible by the bus system; and a fantastic weekly farmers market, with fresh local tomatoes, English cucumbers, fresh French bread and pastries, corn, and much more. With limited internet access in the anchorages and moorings, we are learning the value of the local library. Vero Beach has one of the better library systems that we have visited. 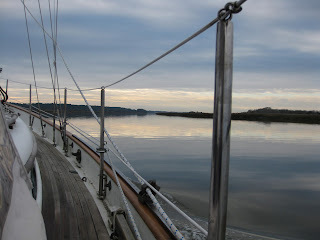 We spent a day doing ‘homework’ today, and got more done there than we could for a week at the mooring wirelessly. Sunset at our mooring in Vero Beach, FL. Reflections in the morning at our mooring in Vero Beach, FL. The turquoise waters of Vero Beach, FL. 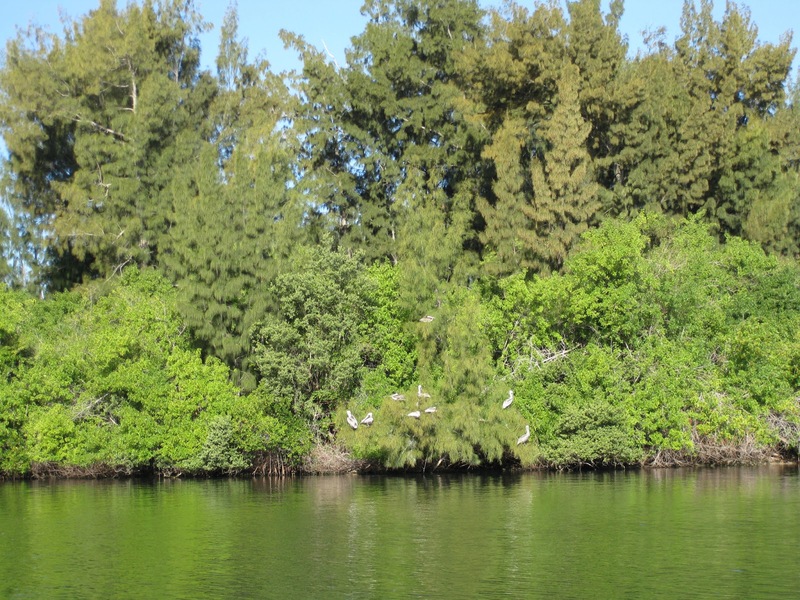 We also found time to discover the abundant wildlife in the area: from the roosting pelicans just off our mooring, the jumping mullet, the dolphin splashing fish up into the mangroves, and the cruising manatees on their way to their favorite feeding grounds. 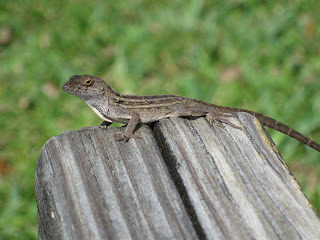 It has been fun to see and live with all the wildlife here. 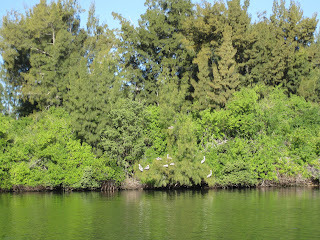 Pelicans roosting in the cedars adjacent to our mooring. A friendly anole hanging out at the bus station bench. 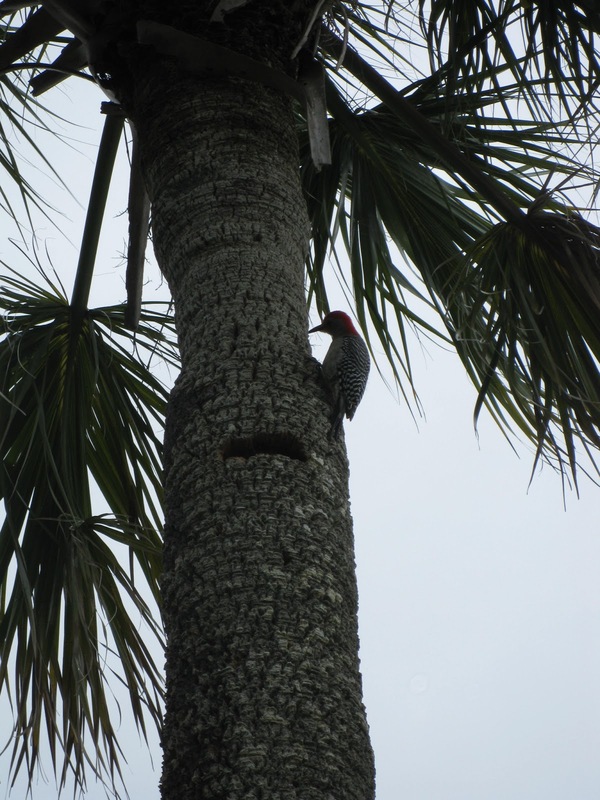 Woodpecker busy collecting dinner from a palm tree. In addition, this time has given us the opportunity to repair/optimize/clean a couple of systems on the boat: including figuring how to charge the batteries with our Honda generator, getting our KISS wind generator operational, replacing a new copper foil track that had corroded and disintegrated along the center line of the boat for the SSB ground system, cleaning the ICW smile off the hull, learning about marine navigation apps for our ipads, and figuring out how to establish a ‘weather resistant’ repeater unit in the cockpit to access our navigation software on a computer at the nav station. Most of these projects are still ongoing. We did have complete success with getting our EU2000 Honda generator to charge our battery bank using our Freedom COMBI Inverter/Charger, Model 25. This was one of those critical tasks. Although we don’t have a lot of power needs on the boat, the fridge and freezer do demand daily power. And remember, we were without an engine while the fuel injector pump was being rebuilt. So we could not charge up the batteries by running the engine, and we could not motor the boat over to the docks to plug into shore power. And then on top of it, the broken wind generator was not helping much either. When we tried charging our batteries the first time with the Honda, the generator would overload and go into idle. 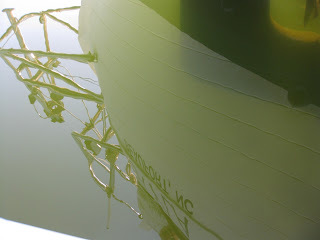 We met a couple moored adjacent to us in the marina on the bus one day, and they had experienced the same problem. Tom from Circe revealed the key to success: decreasing the ‘power sharing’ on the Heart Interface control panel to 15 or 20 amps. Once we lowered the power sharing amperage needs, we have been able to fully charge our battery bank daily. 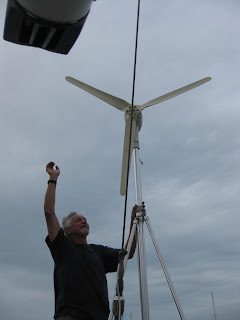 We are still working on the KISS wind generator. When we bought the boat, the previous owner told us that the wind generator wasn’t working, but he had bought a repair kit, and he was convinced it would be a simple fix. We replaced everything that could be replaced (bearings, seals, etc. ), but found out that the problem was a result of the rotor being slightly out of alignment (the stator is a very powerful magnet). We finally got the wind generator working while Layla was on the hard, but just before we put her in the water last summer, someone in the boat yard hit the generator with a crane, and knocked the shaft out of alignment. And so, while at Vero Beach with ample time on our hands, we decided to revisit the old problem once again. We took old ‘Jennie’ down and up multiple times, realigning the rotor (the shaft) within the stator (the armature), and sometimes were lucky enough to get her going for some time. But eventually, the shaft would move just slightly and the blades would no longer rotate freely. 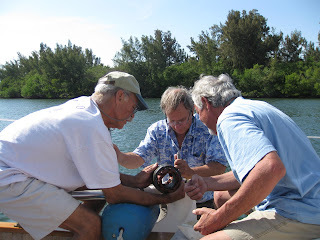 We finally found help from the internet, from another cruising blog describing a similar problem, and are now working with the US distributor, Hotwire Enterprises out of Tarpon Springs, FL. They seem a lot more business oriented than the inventor and very knowledgeable, and hope that we can get it operational before we leave Vero Beach. Fred, Ernie, and Bud, in deep prayer, to the gods of the KISS wind generator, as they disassemble and reassemble 'Jennie' again and again. Bud and Ernie, 'realigning' the rotor and stator. Sometimes a hammer helps to release frustrations. Bud giving 'Jennie' a little hand to encouraging her. Installing the new copper foil was a partial success. We improved our SSB reception and transmission dramatically (we now have decreased the standing wave ratio from 2.5 to 1.5). However, we still have some improvements to do. In the process of laying down the new track of copper foil, we discovered another track that was removed. We have enough copper foil to replace that track as well, and hope this gives us even better transmitting power. We will keep all of you posted, hopefully by email from the SSB. 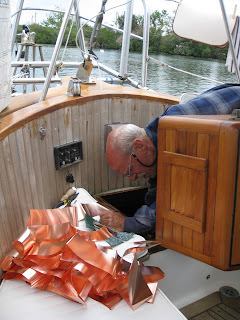 Fred helping install new copper foil for the SSB ground system. As far as the ICW smile goes, the toilet bowl cleaner called ‘The Works’ did as well as the internet described. ‘The Works’ is based on hydrochloric acid, which is a much stronger acid than the more commonly recommended products containing oxalic acid and is not organic based, and so is more likely to remove the ICW tannins and less likely to remove the hull wax. It probably took a couple minutes of soaking with reapplication of undiluted ‘The Works’, but once soaked long enough, the smile disappeared. Right now, we are still novices with the ipad apps, but have learned about Active Captain, which is integrated into several apps. 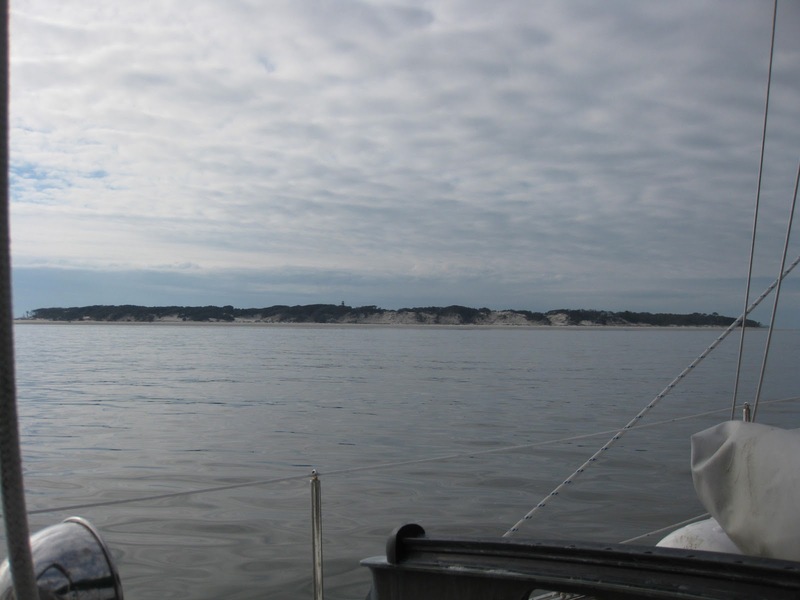 Active Captain is a web portal, integrating cruising experiences from the cruising community, including marina, anchorage, and hazard information along the ICW. Too soon to report on our favorite, as we are still becoming familiar with vector-based (integrating information from all the charts-of-old to allow for seem-less integration of charts) and raster-based (similar to the traditional charts-of-old, with each chart limited to specific areas, and pulling up the respective regional chart as you go) charts, but believe that a combination of both is probably the way to go. As for the repeater unit, we are currently using an old slow Panasonic Toughbook to access a relatively new speedy Le Novo ThinkPad wirelessly via Remote Desktop. It does work, but the refresh rate of the ThinkPad is far too fast for the old Toughbook. We will probably still play around with the Toughbook for a while, but may consider another bigger/faster alternative in the future. 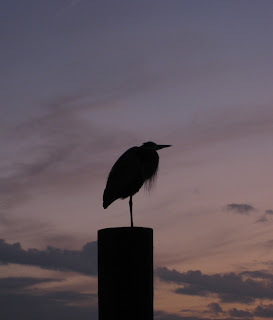 Overall, we have found that the time spent in Vero Beach has been productive, satisfying, and even fun. Although it has been good, we are looking forward to leaving. Once the parts for 'Genie' arrive, I imagine we will be heading out soon. We will keep you posted. 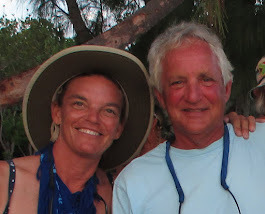 Bud has redefined the meaning of cruising based on our first two months of this journey. 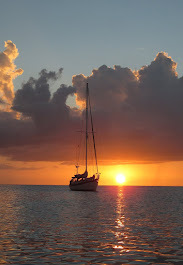 The Oxford dictionary defines cruising as “sailing about in an area without a precise destination, especially for pleasure”. 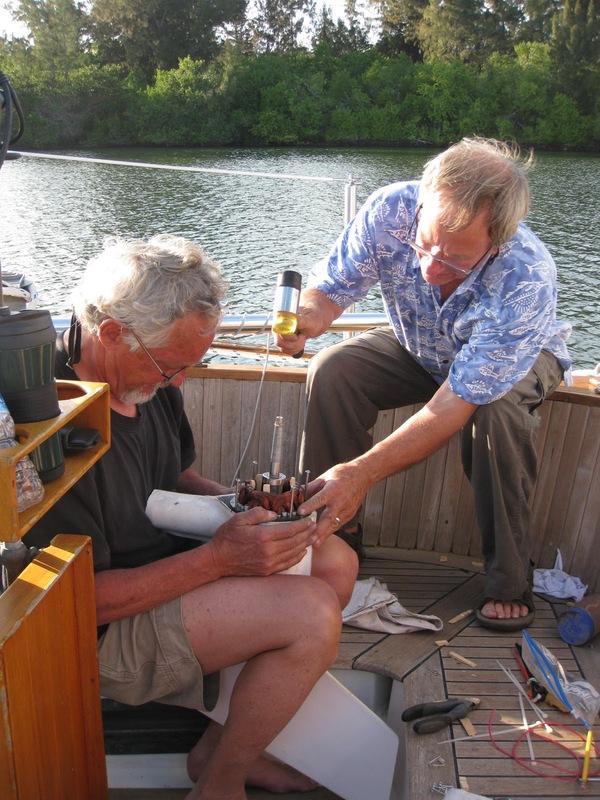 Some say that cruising is another word for fixing your boat in exotic far-away places. 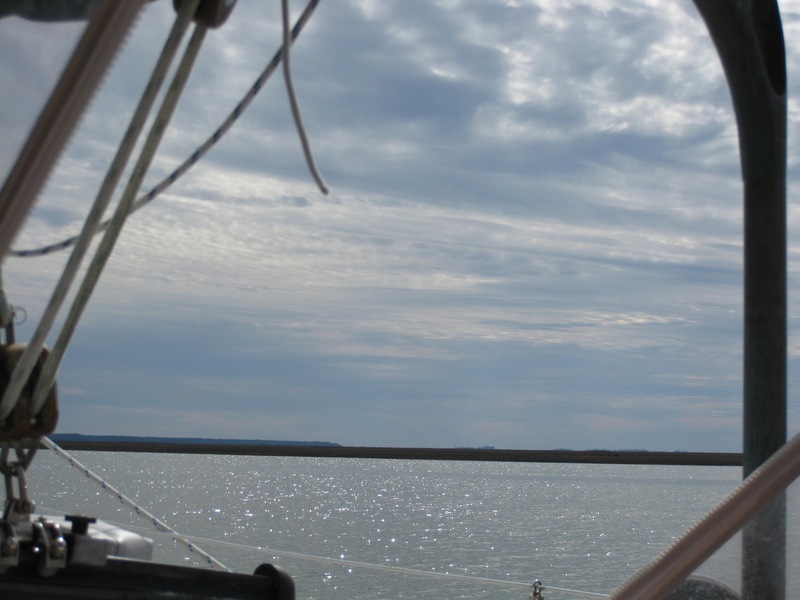 From our experience, cruising is just another word for scouting out all the remote hardware stores at every anchorage, mooring, or docking along the way. My dad would be proud; from a very young age, I served as my father’s apprentice, which included at least one trip to the Ace Hardware store every weekend. The learning experience has helped me navigate….not the waters of the ICW, nor the currents around the world, but the aisles of any hardware store across the globe.